Update March 2019: All Google+ Pages will be deleted when consumer Google+ shuts down on April 2, 2019. That will not affect YouTube channels, Google My Business listings or Brand Accounts. Update October 2017: Google My Business no longer creates a Brand Account along with a business listing, which means no way to connect Google+ or YouTube to a new listing. Update May 2017: Google My Business no longer automatically creates a Google+ Page along with a business listing. Update January 2017: Google+ Brand Pages are no longer supported on the Google My Business dashboard. Update August 2016: Google My Business Insights no longer include Google+ Page information, and the Google My Business app no longer supports Google+ Pages. 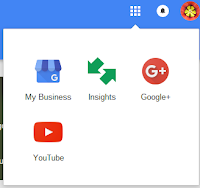 Update September 2015: Google My Business logo updated with new "G"
Google has just launched Google My Business (GMB), a brand new interface for Google+ Pages. Despite the name, Google My Business isn't just for businesses. It's also for Google+ Pages that represent brands, organizations, bands, YouTube shows, or any identity other than a common name. So what's new? For Google+ brand Pages, the new GMB dashboard is a one-stop-shop for managing your Page and getting a snapshot of your Page and connected website and channel's activities. You can also edit your Page details and manage your Page's Managers and Settings. 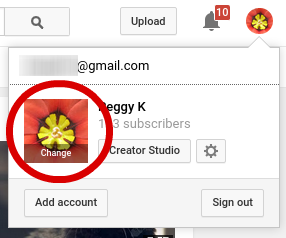 Another nice update for YouTube creators: you can now easily navigate from your Google+ Page to your YouTube channel. 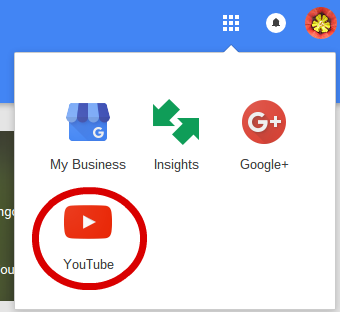 Now when you are managing your Google+ Page, you can use the Google App launcher to easily navigate to your Page's Google My Business dashboard, Insights (Analytics), your Google+ Page and your YouTube channel. When you are managing your Google+ Page, you can use the Google App launcher to open your connected YouTube channel. Open the app launcher by clicking the icon on the top menu that looks like a grid of 9 dots. You must be signed into YouTube with a Google account that manages your Google+ Page for this to work. 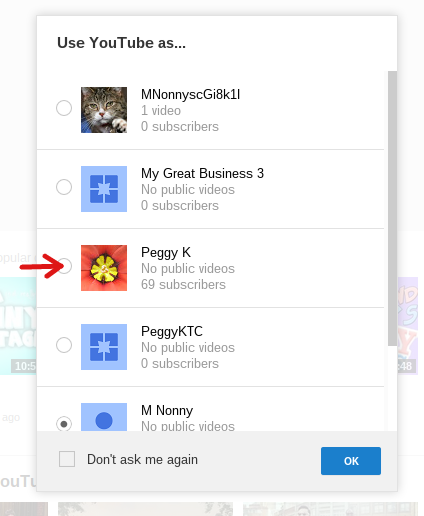 If you don't see your Google+ Page identity on the list, or YouTube opens using the wrong channel identity, you can switch channels by clicking your YouTube avatar and selecting "Switch account" from the top menu. 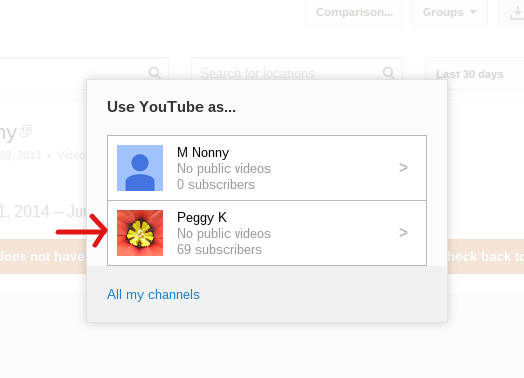 If you have a YouTube channel connected to your Google+ Page, the GMB dashboard will show an overview of views and subscriber data. How do you get to the new GMB dashboard? Once you are signed into Google+ and managing your Page, the easiest way is to get to the new GMB dashboard is to click the "My Business" icon in the app launcher. You can also use the left navigation menu on Google+. The My Business link at the top of the menu will take you to the GMB dashboard. 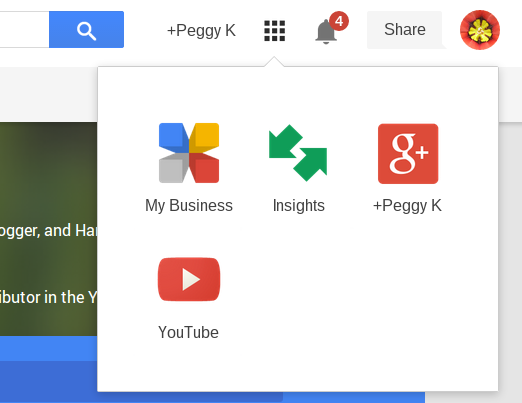 4/18/15: Updated screenshot with the new Google My Business icon. At the top of your new My Business dashboard, you will see and overview of Insights about your Google+ Page, including views and post engagement. If you have a YouTube channel connected to your Google+ Page, you will see a section (not-surprisingly) titled "Youtube" that displays recent data from your YouTube dashboard. If you would like to see more detailed data, click the blue "Go to channel" button to go directly to YouTube Analytics for your channel. Once you select a channel, YouTube Analytics will open (www.youtube.com/analytics). Use the Google My Business app on your smartphone or tablet to manage your Pages and view Insights. The free Google My Business app is available in the Google Play Store for Android devices and the iTunes store for iOS devices. Last update: March 2019 to remove Google+ links and outdated Google My Business help center links. Back up your YouTube videos!